Toxikk is a classic FPS that’s going back to the roots of the arena shooter, if their debut trailer is anything to go by. It’s taking a stance on equality by doing away with classes, leveling systems and weapon upgrades, and also getting rid of cover systems, automatic health regen and iron sight aiming (IAS). What you will get is double jumps, booster pick-ups, infinite weapon capacity and a multitude of multiplayer maps that promote a variety of playstyles. Some of the bigger maps even contain vehicles wreak havoc on the battlefield. Toxikk has also shunned free-to-play, saying that it “contradict[s] the idea of classic arena FPS gaming” with paid for unlocks and upgrades. It’s immediately apparent that Toxikk takes inspiration from the likes of Unreal Tournament and Quake. 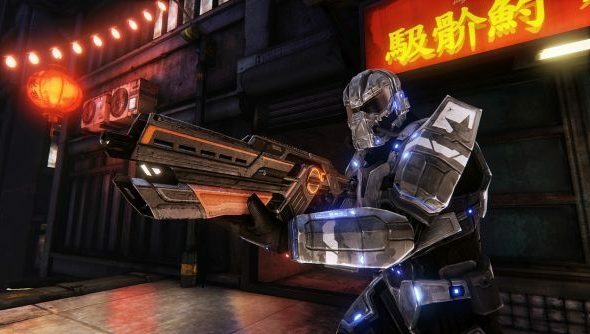 “Designed as a spiritual successor to the fast paced arena shooters of the late 90s and early 2ks.” says their website. “There is no leveling, no skill-trees, no perks, no cover systems, no classes, no configurable weapons and no iron sight aiming. Maps will come in two varients: classic and massive. Classic will feature eight players inside small-medium sized maps. Massive maps on the other hand can contain up to sixteen players, and will also exclusively feature vehicles. Custom made maps from the community will also be made available for free. The PC exclusive will be on Steam Early Access towards the end of the year for beta testing, and released soon after.